"Like Valutec, Mosser is well-known for its high quality. We're proud that Mosser chose us", says Robert Larsson, Valutec CEO. Because of its uncompromising quality standards, Mosser has become a leading producer of glulam. Thus far, the company has mainly used conventional batch kilns, but for this new investment it chose the proven, patented Valutec continuous kiln solution. "In our decision to choose a kiln producer, the quality of the dried timber was paramount – with Valutec, we were definitely on the right track. "What's more, Valutec has many years of progressive kiln experience and can present excellent Austrian references," says Thomas Harreither, MBA Sawmill Manager at Mosser. The continuous kiln is used exclusively for drying timber used for glulam production to a final moisture content of 12%. This was an additional criterion in our choice of a continuous kiln, as the efficiency when drying stacks of comparable sizes and dimensions is at its highest. 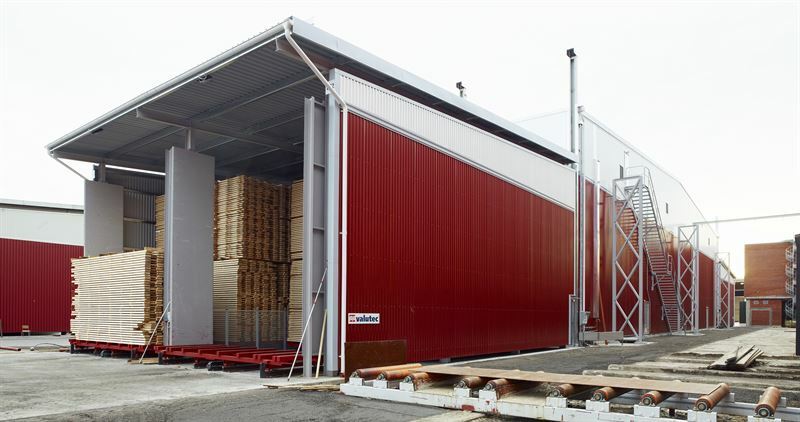 "With large volumes of timber, a continuous kiln with its uninterrupted operation is far superior to a batch kiln, both in terms of capacity and energy consumption," says Robert Larsson," Valutec CEO. The stainless steel designed kiln has an annual drying capacity of 50,000 m3 (21,190 MBF) and uses the Valutec Valmatics control system. It has buffer zones for 20 stacks before and after the kiln itself. Commissioning is planned for April 2019. "Thanks to the two buffer zones and automatic feed, the continuous kiln requires no manning at weekends, which makes production planning considerably easier," says Thomas Harreither. Valutec has established itself as a leading supplier of continuous kilns and the order from Mosser is the fifteenth continuous kiln delivery by the company to central Europe in the past ten years. There is huge market potential for timber drying in central Europe, where increasing quality demands from customers leads to greater volumes of timber that are being dried. "This trend has opened up new opportunities for us at Valutec. Our long-term strategy and continued technological development are based on our assertion that our kilns are the best choice when it comes to optimizing quality, capacity and energy consumption," says Robert Larsson.